MK Land has so far locked in RM138 million in joint-venture projects, which will help it settle its loans in stages. PROPERTY developer MK Land Holdings Bhd will continue with its strategy to form joint ventures for land development and selling land that it does not plan to develop to reduce its debt. The group has settled borrowings by RM98 million to RM398 million through asset realisation exercises and more stringent cash flow management. In 2008, it was riddled with some RM550 million in debts. Chief operating officer Lau Shu Chuan said MK Land has so far locked in RM138 million in joint-venture projects, which will help it settle its loans in stages. Over the last two years, the group has made RM162 million in land sale after disposing of 9.3ha land in Damansara Perdana for RM150 million and 2ha land in Cyberjaya for RM12 million. 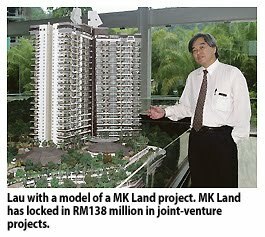 For the financial year ended June 30 2010, MK Land posted a RM11 million net profit on the back of RM308 million in revenue. "We have put in place various strategies to improve operations and standards of services to strengthen relationship with bankers, contractors, consultants and purchasers," Lau said after the group's annual general meeting in Kuala Lumpur yesterday. MK Land has some 2,025ha of landbank, of which 1,620ha is located in Lembah Beriah, Meru Perdana and Bukit Merah in Perak. Lau said the group is waiting for the completion of the Alor Pongsu interchange in Perak before launching property development projects there. "The construction is said to start next year and will be ready in two years. Hopefully we can start developing the land by then." The Alor Pongsu interchange will ease the entries and exits to the North-South Expressway and is expected to boost the development in Bandar Lembah Beriah. Meanwhile, in the Klang Valley, MK Land will continue with its ongoing mixed development projects in Damansara Perdana - three-storey semi-detached house projects namely Rafflesia, Armanee Terrace and Metropolitan Square. It is also undertaking a RM3 billion project to develop affordable housing in northern Bangalore, India. MK Land is partnering two other companies in the project - Embassy Group of India and MKN Embassy Development Sdn Bhd. The project will be undertaken in four phases and developed within five years. It will potentially build 16,000 affordable houses, ranging from 650 to 1,200 sq ft, and about 560 retail outlets. SUBANG JAYA: MK Land Holdings Bhd is not ruling out the possibilities of merging with other property players, according to chief operating officer Lau Shu Chuan. 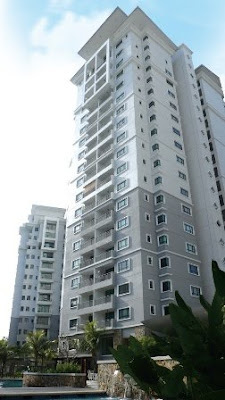 MK Land’s previous project – the Metropolitan Square condominium in Damansara Perdana township. If it (potential merger) is better for the company, why not? We're always open, he said after its AGM yesterday. Lau said the group did not mind if someone with deep pockets was interested in such a proposition. However, he said the group had yet to receive any proposals. Lau added that they would look at the potential value if such an opportunity arose. Commenting on the mergers and acquisitions in the property industry, Lau said companies were leveraging on one another and merged if there was a synergy. We believe there is still room for niche market players, he said, adding that the product and location of the property matters if its landbank was strategic. Meanwhile, Lau said the group hopes to achieve better results in the current financial year ending June 30, 2011 (FY11) boosted by ongoing projects and new launches. He said the group had achieved improved financial results year-on-year since FY08. For the first quarter ended Sept 30, MK Land posted a net profit of more than doubled to RM3.4mil from RM1.2mil a year ago. However, revenue for the period was lower at RM61.7mil against RM80.8mil previously. MK Land posted a net profit of RM11.2mil on revenue of RM323.5mil in FY10. Our financial performance have been on an uptrend. Arising from this, we expect to maintain this kind of growth going forward, Lau said. He said its main contributions would come from its projects in the Klang Valley as its other projects was somewhat weaker. We're talking about RM100,000 to RM200,000 per unit for houses outside Klang Valley and a unit in the Klang Valley is between RM1mil and RM2mil, Lau explained. The group has also sold some of its assets and the cash generated was used to pare down its borrowings. Lau said it sold 23 acres of its land in Damansara Perdana and five acres of land in Cyberjaya. The group had managed to pare down its debt to RM398mil as at June 30 from RM550mil in FY08 and intends to trim it further. Lau said the group had managed to lock-in over RM300mil from the sale of its land and joint venture projects. He said the money from selling its land had come in but expects cash inflow from its joint ventures to flow in over a period of time. Our gearing of 0.36 times is not a frightening figure but we realised that we are paying a lot of finance charges. The group still has capacity to borrow more. We're not over-geared. We may gear up ourselves in future if needed, Lau said. MK Land has a total landbank of about 5,000 acres worth some RM800mil on its book. In terms of market price, it could be higher, Lau said, adding that some 4,000 acres of its land were in the northern part of peninsula. AGAINST the backdrop of still-distressed economic conditions in the Euro zone, Chinese inflationary worries and perhaps most disconcertingly, the war games in the Korean Peninsula, major shareholders, corporates and bankers are realising that the window for deal-making could be fast closing. Also perhaps these deals are via the asset-liability route and requires currently only 50% approval compared to other routes which requires at least 75% approval from disinterested shareholders and thus want to take the opportunity now to do these deals without needing to entice a larger portion of minorities and with a price that may need to be good enough for the deal to go through. These recent spates of deal making, however, need not necessarily be a bad thing if two key questions are answered: firstly, whether minorities are getting a fair and reasonable offer for their shares, and secondly, whether they have the option to ride on the upside of the merged entity's, if any. First, the UEM Land-Sunrise merger. UEM Land has offered Sunrise shareholders RM2.80 for their shares in an all-stock deal, and has rejected calls to raise its RM1.4bil offer even though Sunrise shares have risen beyond the offer price. Being an all share deal the minorities can ride on the upside nevertheless, if any. The market price of Sunrise has risen above the offer price and minorities have the option to sell into the market. As it stands, three of Sunrise's major shareholders, namely Datuk Tong Kooi Ong, Datuk Allan Lim and Tan Sri Tan Chee Sing, with a combined 40.34% stake have agreed to the offer. However, UEM Land still needs another 9.7% for the deal to happen. This was where minorities, who had reason to push for a better price, may do so, or reject the deal. As for the RM7bil merger plan between MRCB and IJM Land, the Employees Provident Fund, being a major owner in both entities looks like the kingmaker in this instance. As master developer of the Rubber Research Institute's 3,300-acre parcel of land (next to Kota Damansara, Selangor), the EPF quite simply needs the expertise to make this new township a success, in line with the aims envisaged under the country's Economic Transformation Programme. The property sector is key to Malaysia's growth, and the EPF needs developers that can build townships as well as commercial projects, in a broad plan that will benefit EPF members. The proposed merger would be implemented through a scheme of arrangement under Section 176 of the Act, and while both companies have yet to come up with a definitive agreement, it has been stated that a new company would be formed, in which both IJM Land and MRCB would exchange shares, or a combination of shares and cash. Shares in IJM Land and MRCB would be exchanged based on RM3.65 per share for IJM Land and RM2.30 per share for MRCB. The offers represent a 19% premium and 7% premium respectively to IJM Land's and MRCB's last traded share price prior to suspension. Pending further details, there appears to be a premium to the last traded prices, but the upside to this offer is the exposure to the potential of the 3,300 acre development, an area three times the size of Petaling Jaya. Minority shareholders of both companies might take heart, since it seems illogical that the EPF would want to exit what was essentially a deal of their orchestration. The deal pricing, at 2.5 times price-to-book for IJM land and 2.6 times for MRCB, also appear fair. Minorities might also want to see how IJM Corp, who as 60% owners of IJM Land, reacts to this deal. IJM Land, after all, did suffer from liquidity issues pre-merger plan, and such a deal would almost certainly boost liquidity. A definitive agreement between MRCB and IJM Land was expected to be sealed by Dec 14 this year. 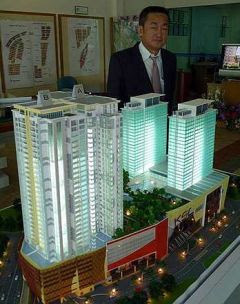 And lastly, the plan by Tan Sri Jeffrey Cheah to combine Sunway Holdings and Sunway City in a RM4.5bil deal. Tan Sri's intention appears two-fold: firstly to create a bigger entity to win larger jobs, and secondly, to safeguard against hostile or unwanted takeovers. A new company would be formed, where Sunway City would be valued at RM5.10 a share, or a fairly high PE of 12.4 times 2011 earnings, itself at the higher end of the company's 0.5-12.5 times historical PE ratio band. Sunway Holdings, whose shares are valued at RM2.60 a share under Tan Sri's offer, translates into a PE of 10 times 2011 earnings, and 1.7 times price-to-book value. Most significantly, Sunway's new company was said to be valued at 12.6 times 2011 PER, which was a significant discount to the other property developers such as SP Setia's 22.8 times, UEM Land-Sunrise's or IJM Land-MRCB's which was above 30 times. It is easy to see the respective intentions behind all three deals to create bigger companies to give capacity and capability as well as attracting more investors with the bigger size. A bigger footprint also puts the merged companies under the radar of foreign institutional funds, which was good for capital markets. It was also an argument that applies to a merged Sunway property-construction company. But deal making and the travails of the global economy aside, the concept of Quid Pro Quo should operate: make it win-win for all parties involved, otherwise expect time to be wasted before the deal can be concluded. In any case the primary and initial concern should be to obtain the unequivocal buy-in of the minority shareholders? Beyond question, property companies with significant land banks, financial strength and development expertise would be crucial in succeeding in the future, especially since there are broad expectations for the property sector to stabilise and morph into a medium-housing play in the medium- to long-term, minus the hefty margins of today. It's just that in the process of getting there, everyone should benefit. And minority shareholders, who many of them took the earliest leap of faith with the companies involved, should be the ones that need to be given consideration in terms of fair price, first and foremost. LANGKAWI: Khazanah Nasional Bhd, the investment holdings arm of the Government, expects to invest RM1bil with its partners between now and 2014 to develop Teluk Datai in Langkawi. 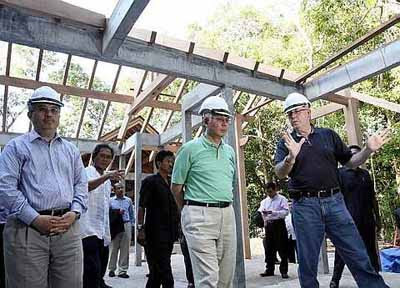 Peremba (M) Sdn Bhd director of development John Ballantyne (right) briefing Datuk Seri Najib Tun Razak during a tour of the Teluk Datai Resorts development. Accompanying them are Tan Sri Azman Mokhtar (left) and Peremba executive chairman Tan Sri Razali Rahman (second left). Managing director Tan Sri Azman Mokhtar said the development would be done through Teluk Datai master development plan and Khazanah would get involved via its investee company Teluk Datai Resorts Sdn Bhd. Under this master plan, we will re-invest in the existing hotels in Teluk Datai and investment in select pieces of earmarked land in an environmentally sensitive manner, he said yesterday at the launch of the master plan. In July, the group acquired 70% stake in Teluk Datai Resorts, which owns The Datai Langkawi hotel, The Golf Club, Datai Bay and 1,494 acres at Teluk Datai. The remaining 30% interest in Teluk Datai Resorts are held by Tan Sri Razali Rahman and Datuk Hassan Abas through Archipelago Hotels (East) Sdn Bhd. Azman said Khazanah's investment in Teluk Datai Resorts was in line with the Government's efforts to drive the economy upwards under the Economic Transformation Plan. It is also consistent with the key thrust of the New Economic Model of moving Malaysia towards a high income economy, supported by high-skilled local labour force and sustainable products and services and embodies the spirit of collaboration and partnership between the public and private sector, he said. The first of the projects under the plan was to enhance The Datai Langkawi hotel through the development of 14 luxury villas, expected to be completed in the first quarter 2012. Teluk Datai Resorts had also commenced reviewing the realignment of The Golf Club, Datai Bay to upgrade the golf course and also enable the land to be optimised for beachfront development, targeted for completion in the third quarter of 2012. At the event yesterday, Teluk Datai Resorts also signed a head of agreement with Shangri-La Hotels (M) Bhd for the establishment of a joint-venture company (51% would be owned by Teluk Datai Resorts) to develop a 5-star resort there that would later be managed by Shangri-La Int Hotel Management Ltd under the Shangri-La brand. It was expected that there would be another premium 6-star hotel and a selection of premium villas for sale in Teluk Datai. To preserve the environment during the development, Teluk Datai Resorts has engaged Camco South East Asia to undertake a sustainability study. It also announced that the group had adopted Sekolah Kebangsaan Ewa as part of its corporate social responsibility initiatives.